Over the past year, Saskatchewan maintained its role as a global leader in potash and uranium production. Saskatchewan remained the world’s largest potash producer, and second largest uranium producer, accounting for approximately 29 per cent and 22 per cent of global production respectively. The province set a record for volumes of potash produced and sold in 2017. A number of other commodities, including gold, coal, base metals, sodium sulfate, salt and clays, were also mined. The total value of mineral sales in 2017 was $6.7 billion (B), a moderate increase from the $6.4B in 2016 but still down from the $8.2B realized in 2015, and the $7.3B in 2014. These decreases are a reflection of languishing commodity prices, particularly for uranium and potash. Although average realized potash sale prices have seen incremental gains over the past couple of years, they are still well below the 10-year average. Uranium spot prices throughout 2017 and the first half of 2018 have fluctuated somewhat but have generally been less than 50 per cent the value of their 10-year average. 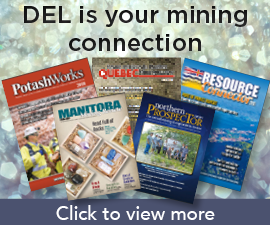 Despite the current lower prices for its principle commodities, Saskatchewan continues to be recognized as one of the most favourable jurisdictions in the world for investment in the mining sector. This was reflected in the Fraser Institute’s 2017 Survey of Mining Companies, in which, out of 91 jurisdictions, Saskatchewan ranked first in Canada and second in the world in investment attractiveness, a composite measure of geologic potential and policy factors. Another vote of confidence came from the Mining Journal’sWorld Risk Report, which ranked Saskatchewan third out of 96 global jurisdictions for mining investment. 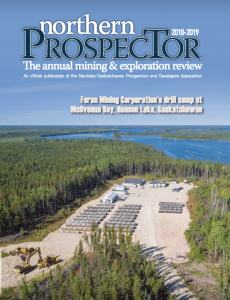 In its annual survey of mining companies active in Saskatchewan, the Saskatchewan Geological Survey (SGS) determined that an estimated $193.5 million (M) is planned for mineral exploration in 2018. Most of the 2018 expenditures were planned for uranium and potash projects, but the survey results also reflected a renewed interest in base and precious metals as well as diamonds. In a separate Canada-wide survey, NaturalResources Canada (NRCan) found that national expenditures for mineral exploration plus deposit appraisals was approximately $2.00B in 2017, down significantly from the $4.23B spent in 2011. NRCan estimates that Saskatchewan’s portion of these expenditures will constitute approximately 7.4 per cent in 2018, down from nine per cent in 2017 and 14 per cent in 2016. Saskatchewan’s decreasing percentage of national expenditures is primarily a reflection of rising base and precious metal commodity prices, for which exploration is more robust in other jurisdictions. As of the end of August 2018, active mineral dispositions in the province (issued pursuant to The Mineral Tenure Registry Regulations) totalled 6.0M hectares (ha), up from the 5.6M ha held at the same time one year ago. Total active potash dispositions (comprising permits and leases issued pursuant to The Subsurface Mineral Tenure Regulations) remained steady at 110 dispositions, totalling 2.9M ha, the same as a year ago. 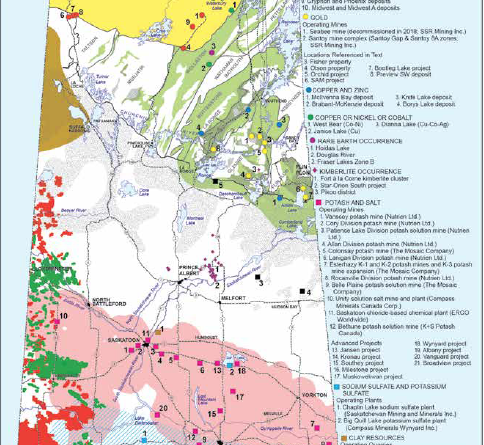 The Saskatchewan mineral industry provides nearly 30,000 direct, indirect and subsidiary jobs, including direct employment for over 2,000 people in northernSaskatchewan, approximately one-half of whom are local residents, mostly of Aboriginal ancestry.